A true all American Saddlebred. A great treasure to be admired for an eternity! Your number one source for Saddlebred jewelry. Are you into three gaited style riding? 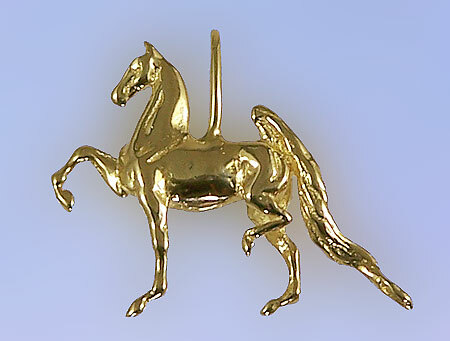 Well if your answer is yes, check out this three gaited Saddlebred pendant. Sure to please any Saddlebred rider out there. Offering complete three dimensional design and a nice weight ideal for everyday wear. Available in 14kt yellow, 14 kt white gold, sterling silver. Have the tail pave with diamonds. It looks really great!